At some point in the future, a scientist named Dr. Gant (Brooks) creates “Cybernauts”, robots with very human characteristics used for law enforcement. Adam (Lurie), Zeus (Malibu, or McBee, or perhaps Malibu McBee), Mandragora (MacDonald) and Cain (Johnston) are bulletproof, never miss when they’re shooting their guns, and have super-strength, among other superlative characteristics. However, when they’re told the program that created them is going to be shut down, their “self-preservation” instinct kicks in. Zeus, Mandragora and Adam then proceed to go on a robot rampage. But Cain separates himself from the murderous bunch. He ends up teaming up with Lt. Jack Floyd (Scalia), a man who initially hates robots but eventually warms to Cain when Mayor Pendleton (Gray) ensures they have to work together as partners. Can anyone – or anything – stop these super-strong, deadly and emotionless killbots? Find out today! T-Force is an excellent example of what PM does best. It delivers the goods – it provides tons of viewing enjoyment, and totally fulfills what this sort of movie should be. Of course, the “T” in T-Force is short for Terminal, going along with what can only be described as the “Terminal” craze of movie titlings in the 90’s. Terminal Force would have been a cool title, but shortening it to T-Force is even cooler. It starts with an amazing intro where the Cybernauts are posing in front of explosions, and we’re treated to many more blow-ups where that came from. Casting Malibu and Evan Lurie as robots was a stroke of genius, and these robo-meatheads (or MeatBots if you prefer), of course, have long hair. Why long, lion-like manes (and in the case of Cain, a propensity for wearing tight jeans) was part of the intentional design of the Cybernauts remains unexplained. But in addition to the plentiful shooting, blow-ups and fights, there are actually ideas and concepts embedded herein that make you think. No, seriously. The screenwriters must have been reading their Socrates, because there are some Crito-like meditations on the nature of law and society. Not to mention humanity. So, there are more real explosions – and ideas – in the final third of T-Force than in the past 20 years of Hollywood pap combined. Playing the archetypal American man that the audience can identify with (he even has an all-American car, a 1977 Cadillac he names Ol’ Betsy) Jack Scalia is at his absolute best here. Endowing Jack Floyd with a lot of energy, not to mention groany one-liners, he provides nice counterpoint to the robotic action. This blows away his performance in Dark Breed (1996). I think we can safely say this is Classic Scalia. But giving him a run for his money is the guy who plays Alderman Peter (we think his name is Sean Moran). He gives everyone a run for their money, including two meatheads exchanging quasi-Shakespearan-style dialogue. Malibu and Lurie together is almost too much meathead for one movie, but at least T-Force reconstitutes the meat into something a little different this time. So in classic 90’s fashion we have tons of mindless killings and blow-ups, dialogue that’s silly when it’s not intellectual, exploding helicopters (and everything else), sax on the soundtrack, and of course the 90’s-future-movie staple, VR. It’s hard to ask for more, and the confluence of classic elements puts this ahead of the pack. PM delivers yet again, with a winner that is indeed T-Forceful. Also check out write-ups from our buddies, Exploding Helicopter and The Unknown Movies! We can see why, it's PM and Scalia at their best. This was another solid PM effort. 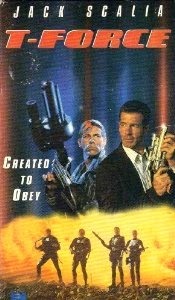 There was a Fred Olen Ray/Richard Harrison movie from 1989 called Terminal Force. Perhaps PM wanted to avoid confusion with that blockbuster? BTW, are you watching these movies for the first time when you review them? Or did you watch them in the 90s and re-watch them now? Personally, I continue finding new classics from the golden video age. 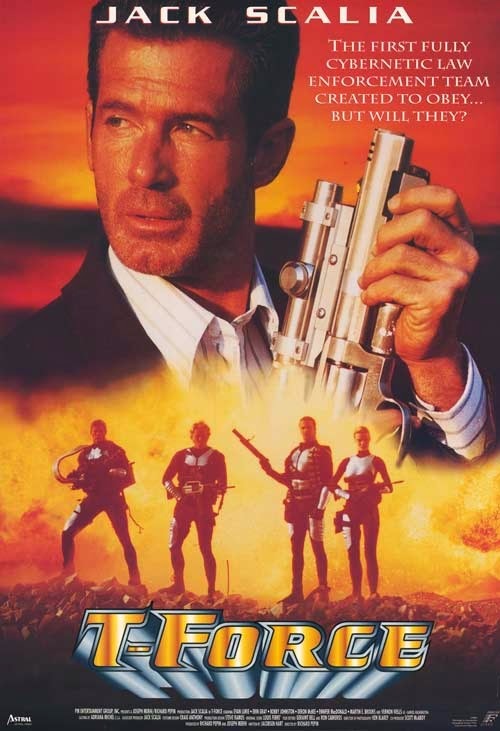 I just watched Codename: Wildgeese and No Dead Heroes last weekend. No Dead Heroes was the better one. Totally agree. Solid outing for PM. Sometimes Brett or I have seen them in the 90s, but we re-watch (or sometimes they're brand new to us) now. Love No Dead Heroes. Agreed, Codename Wildgeese was as good as that. Loved this film, Jennifer McDonald was lovely, too bad she wasn't in more films. Great write up Ty. I've been waiting for you to get to this as I was sure you were going to enjoy it. Like you say, Scalia makes the movie. Given that he's paired with a unemotional robot he has to carry that part of the movie which he totally does. Nice cameo by Vernon Wells. Would've liked it if there was a bit more of him, but hell I'll take any amount of Vernon Wells a filmmaker wants to give me. Thanks for the shout out as well. Venom: Solid PM movie. Agreed, She should've been in more stuff. Exploding Heliocopter: Thanks! Got to love Vernon Wells. He always steals a movie. No problem about the shout-out. Happy to do it.